A nutritious diet is essential for cancer patients to maintain proper nutrition, muscle mass and recover from mesothelioma treatments. Your body needs fat, protein, carbohydrates and plenty of water to help support your immune system and provide you with energy. The most common nutritional problems for mesothelioma cancer patients include consuming too little protein and too few calories, both of which are essential to aid recovery, support immunity and fight fatigue. Begin with a balanced, healthy diet. A balanced mesothelioma diet can help you feel better, maintain weight and energy, fight off infection, manage side effects of cancer treatment and recover more quickly. In the past, people turned to the Food Guide Pyramid for advice on a balanced diet. The U.S. Department of Agriculture (USDA) retired the Food Guide Pyramid years ago and replaced it with My Plate. However, My Plate is not designed to give people with cancer information about their nutrition needs before, during and after treatment. 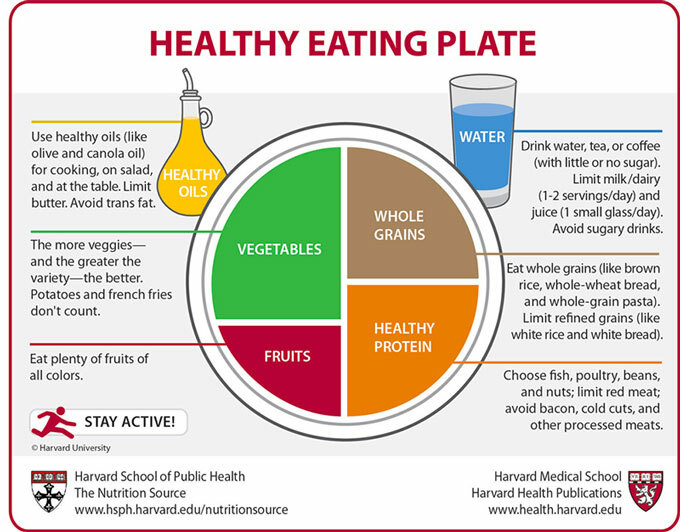 The Harvard School of Public Health created the Healthy Eating Plate, which is a better starting place for designing a healthy diet for people with mesothelioma. The effects of cancer and treatment can make it difficult to eat, so you will need to adjust the Healthy Eating Plate guidelines during cancer therapy to find the best mesothelioma diet for you. For most mesothelioma patients, it is helpful to increase the protein portion of the plate and decrease whole grains a bit. Also, replace green vegetables, salads and other lower-calorie foods with starchy vegetables such as potatoes and sweet potatoes. In some cases, you may need to add a high-protein, high-calorie liquid nutrition supplement. Before dietary changes are made, all patients should consult with their mesothelioma doctor. Some foods contain nutrients that may support recovery after mesothelioma treatment. Consider working the following foods into your diet. Omega-3 fats in fish: May reduce harmful weight loss and inhibit metastasis. Fiber-rich foods: Vegetables, fruit, beans, potatoes and nuts can balance insulin levels, possibly minimizing cancer cell growth. Spices: Turmeric, basil, oregano, rosemary, mint, dill and others have anti-cancer and anti-inflammatory benefits. Natural sources of Coenzyme Q: The nutrient in beef, chicken, pork, trout, herring, sardines, soybeans, lentils and peanuts may protect the heart from chemo damage. Green tea (brewed from loose leaf or tea bag): Rich in antioxidants. Other herbal teas: Chamomile, ginger, mint and hibiscus may have anti-cancer properties. Medicinal teas: Essiac tea or moringa leaf are antioxidant-rich and may have anti-cancer actions in the body. Your doctor or dietitian will let you know if you need to use dietary supplements. Some mesothelioma patients can benefit from a vitamin supplement if, for example, they have a nutrient deficiency. However, you should avoid most dietary supplements during cancer treatment because they can interfere with the effectiveness of cancer therapies. If you want to take any over-the-counter supplements or medications, ask your oncologist first. Meal planning can alleviate some of the stress associated with food shopping and meal prepping when crafting your mesothelioma diet. When food shopping, stock up on the patient’s favorite foods and items important for meeting their nutritional needs. This can reduce the need to shop often. Prepare meals in advance and freeze them in meal-sized portions that are easy to heat. If you want help with planning your meals or preparing a grocery list, talk with a dietitian. Eat multiple small meals throughout the day instead of three large ones. Snack whenever you are hungry, even if it is not mealtime, and enjoy the foods that appeal to you at the time. Drink liquids after meals or as snacks, not before or during mealtime. Liquid can fill you up before you have the chance to consume the whole, nutrient-dense foods on your plate. Include a portion of protein, such as poultry, fish, eggs, beans or peanut butter, at each meal. Juice fresh fruits and vegetables to obtain their nutrients without filling up. If you don’t own a juicer, you can create juice with a blender and cheesecloth. Blend fruit or vegetables with filtered water, then strain with a cheesecloth, which is available at most grocery stores. Consume your favorite foods any time of day. If you love breakfast foods, it’s OK to eat them for lunch or dinner. Create a joyful or relaxing setting by enjoying your food in the company of friends or family. Eat protein-rich foods regularly, such as chicken, fish, lean beef and pork, Greek yogurt, beans, nuts, spinach, cheese, eggs and soy foods such as tofu or tempeh. Add cheese to omelets, sandwiches, soups, salads and casseroles. Increase protein in milk by blending one packet of dry milk powder into one quart of whole milk. Powdered milk can also be added to milkshakes, cream-based soups and mashed potatoes. Add cooked meats to omelets, soups and salads. Snack on cheese, nut butters, roasted nuts or sliced meats. Blend nut butters or ice cream into smoothies and milkshakes and add vanilla or plain whey protein powder for a more balanced snack or meal. Choose desserts made with eggs such as cheesecake, custard and pudding. Avoid foods labeled as low-fat, non-fat and low-calorie. For example, choose whole milk in place of reduced fat. Opt for high-calorie drinks such as milkshakes with added ice cream or fruit nectars. Cook with butter and oil, and add them to meals when possible. For example, top vegetables and bread with butter, or toss oil into rice, pasta and casseroles. Add avocado to sandwiches and salads. Eat guacamole with tortilla chips. Smear cream cheese onto bagels, sandwiches or crackers. Toss salads with high-calorie dressings. Top vegetables with creamy or cheesy sauces. If sweet flavors are appealing, add whipped cream or chocolate sauce to pancakes, waffles, French toast, ice cream and cakes. Mesothelioma treatment can affect your ability to eat as you normally do. You can take proactive measures to meet nutritional needs for each type of treatment. Certain surgeries can complicate eating. Some peritoneal mesothelioma patients may receive nutrition intravenously for a short period of time after abdominal surgery. If you are underweight, you may need to gain weight before surgery. A healthy weight prior to mesothelioma surgery can improve wound healing, reduce infection risk and aid recovery. Chemotherapy affects chewing and digestion because the treatment kills cells in the mouth, hair follicles and digestive tract. If mouth sores develop from the treatment, cool or lukewarm, soft foods may reduce chewing. Some patients receiving cisplatin experience extreme cold sensitivity. If this happens, avoid handling or eating cold or frozen foods. Chemotherapy also may cause nausea, decrease appetite or change the way food tastes. Alterations to your diet and eating habits can help you cope with these side effects. For example, if food tastes metallic, eating with plastic or wooden utensils can help. Receiving radiation therapy around the chest can impact swallowing. It is rare for peritoneal mesothelioma patients to receive radiation around the abdomen, but this can cause digestive issues such as nausea, vomiting, cramps, bloating and diarrhea. Immunotherapy unleashes the immune system to recognize and destroy cancer. Because the treatment removes the usual brakes on immune cells, they can attack normal tissue, too. Side effects of immunotherapy may include diarrhea, vomiting, trouble breathing, cough, rashes, vision changes. They require immediate attention by your oncologist, who may use steroids and other medications to tamp down immune attack on healthy tissue. Certain pain medications can decrease appetite, cause nausea and contribute to constipation. Increasing dietary fiber and water can help lessen constipation. Always drink plenty of water when increasing fiber because without adequate fluids, constipation may worsen. For people undergoing mesothelioma treatment, food safety is crucial because patients can be at heightened risk for foodborne illness. That’s because cancer therapies, such as radiation and chemotherapy, often weaken the immune system. A weakened immune system may not properly fight bacteria, parasites or other potentially dangerous organisms in food. In summary, following proper nutrition guidelines set by a registered dietitian with experience dealing with cancer patients is the best way to maintain all the nutrients you need for a healthy mesothelioma diet. Yang, W. et al. (2019, February 21). Association of Intake of Whole Grains and Dietary Fiber With Risk of Hepatocellular Carcinoma in US Adults. Gorjao, R. et al. (2018, December 4). New insights on the regulation of cancer cachexia by N-3 polyunsaturated fatty acids. World Cancer Research Fund. American Institute for Cancer Research. (2018, May). Third Expert Report on Diet, Nutrition, Physical Activity and Cancer: A Global Perspective. De Carvalho, C.M. et al. (2017, August 30). Plasma glucose and insulin responses after consumption of breakfasts with different sources of soluble fiber in type 2 diabetes patients: a randomized crossover clinical trial. Kim, Y. and Je, Y. (2016, January). Dietary fibre intake and mortality from cardiovascular disease and all cancers: A meta-analysis of prospective cohort studies. De la Iglesia, R. et al. (2016). Dietary Strategies Implicated in the Prevention and Treatment of Metabolic Syndrome. Yao, Z.H. et al. (2013, December). Prognostic nutritional index predicts outcomes of malignant pleural mesothelioma. Jing, K. et al. (2013, October). Omega-3 polyunsaturated fatty acids and cancer.